Leaving the port of Monte Carlo in Monaco, France the Windstar Luxury Cruiser sails into the open sea taking passengers to another paradise. All four masts are raised on this luxury cruiser that leaves the port of Monte Carlo in Monaco, France into the wide open sea with passengers who like the more intimate cruise ships. The Windstar has many different itineraries available that travel either the Caribbean Sea or the Mediterranean throughout various times in the year. This particular trip on the Windstar had Monte Carlo as a port of call so that the passengers can see how the high rollers live and get a chance to explore this glamorous resort. Monte Carlo is one port that you will not forget as the glitz and glamour is one that sticks in your memory for years to come. 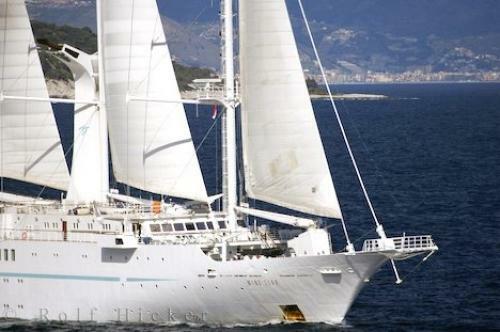 Photo of a sea cruiser that set sail from Monte Carlo in Provence, France known as the luxurious Windstar Cruiseship. Pictures from photo gallery "Cruise Ship"
This picture is part of the photo album "Cruise Ship" - there are more beautiful images waiting for you. When ideas run thin on how to surprise a loved one or where to take a vacation, remember the Windstar cruise ship. Visiting Monte Carlo, France, cruising the open sea under the beautiful Mediterranean sky and being waited on daily is what the Windstar Cruiser is all about. I photographed this photo with the digital SLR camera model Canon EOS-1Ds Mark II, aperture of f/7.1, exposure time of 1/250 sec. on ISO 100, as always I used a original Canon Lens, the focus lenght for this picture was 400mm.